The western side of the Mint Yard is dominated by the Parry block. This was initially built as classrooms and a day boys’ hall by Headmaster George Blore in 1881 and the upper floor was opened as the Parry Memorial Library, named after Edward Parry, Archdeacon of Canterbury and Bishop of Dover, in 1891. 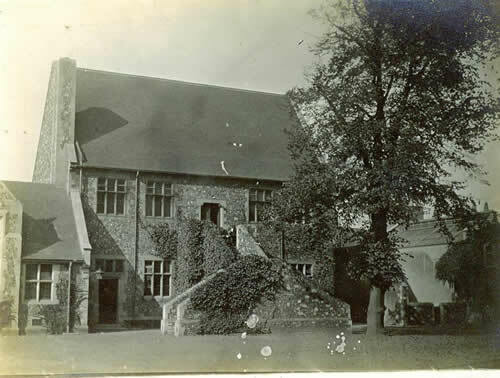 Later this became an assembly hall and eventually laboratories. The buildings have been much added to since. The Alford Laboratory was built as a memorial to Dean Alford who died in 1871. The Harvey Laboratory was opened in 1905. To the right of the Parry block were fives courts (visible in this photograph) and the gymnasium.